San Marcos, CA - On Thursday, February 12th, 2009 His Grace Bishop Maxim together with the Clergy of the Western American Diocese gathered for the Annual Clergy Meeting and Seminar at the St. Petka Serbian Orthodox Church in San Marcos, California. The day began with a fellowship luncheon in the main hall. The annual meeting of the Clergy and the meeting of the Diocesan Kolo Sestara (Circle of Serbian Sisters) followed. The much anticipated Clergy Seminar began at 3:00 p.m. which featured special guest speaker, V.Rev. Paul Tarazi, Th.d.. Fr. Tarazi spoke on the topic, "The Priest as Pastor". At the conclusion of the Seminar Vespers were held in the St. Petka Church followed by dinner. After many had retired to the hotel for the evening, the members of the Diocesan Council gathered for their meeting. 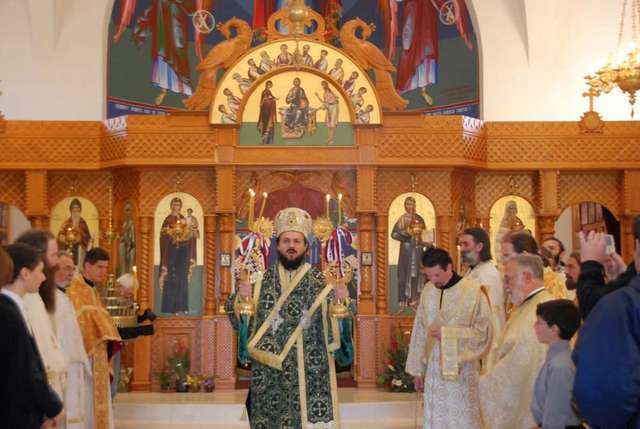 On Friday, February 13th, 2009 His Grace Bishop Maxim together with the Clergy and Delegates from each Parish in the Western American Diocese gathered for the Annual Diocesan Assembly at the St. Petka Serbian Orthodox Church in San Marcos, California. The day began at 9:00 am with the Invocation of the Holy Spirit. A continental breakfast was served while Clergy and Delegates registered. This year the Keynote address was given by the Fr Paul Tarazi, Professor of Old Testament at St Vladimir's Seminary. Fr. Paul spoke to our Clergy and guests on the topic,"The Church Community in the New Testament". Following the lecture, Fr. Paul answered questions from the audiance. A delicous luncheon was served following the Keynote Address afterwhich the Assembly reconvened. Following Verspers at 5pm three young enthusiatic students, Alexander Berger, Elizabetha Kasic and Jelena Tasic presented their Oratorical Essays for the St. Nikolai of Zicha Oratorical Festival. The student who placed 1st will go on to the National Sabor in August to compete other 1st place winners from other Dicoese. On the final day of the Assembly, Saturday, February 14th at the St. Petka Serbian Orthodox Church, all the Clergy and faithful joined His Grace Bishop Maxim in the celebration of the Divine Liturgy at which time Hierodeacon Hilarion from the St. Herman of Alaska Monastery was ordained to the Holy Priesthood. Following the Holy Liturgy everyone traveled to the Sretenje Monastery Grounds where lunch was served. Following lunch the Clergy and Delegates returned to St. Petka for several more hours of Assembly work. Upon completion of the last meeting everyone departed to their homes and parishes.This year's three day Assembly of lectures, meetings and fellowship hosted by the parishioners of St. Petka Church was a very successful and productive event enjoyed by all who attended.